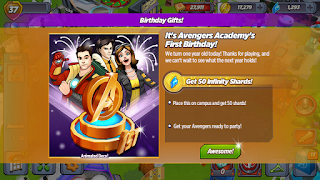 Omigosh Avengers Academy is 1! How exciting! TinyCo have dropped a lil present into our game to celebrate - woohoo! Wasp: Tony! It's our one year anniversary! Iron Man: What should we do? Wasp: You should build a commemorative statue! Iron Man: Couldn't we just get a cake? Wasp: You should totally bake a cake too! 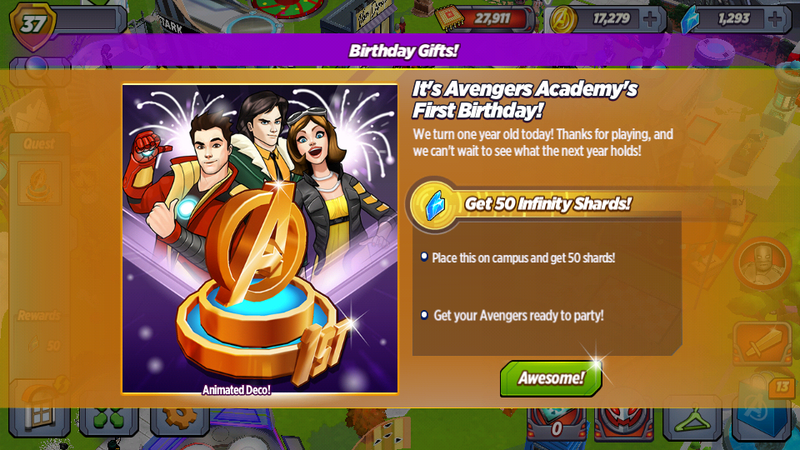 Place the Avenger's Birthday Statue! Loki: It's nice to see everyone celebrating the anniversary of my arrival at Avengers Academy. Loki: No one asked for your opinion, Baby Cthulhu. On top of that, there is a sale on Vision! 995 Shards reduced to 535! So if you were waiting for a chance to recruit him in this event, that time is now! So there you have it! A cool new deco AND free shards?! Winner!